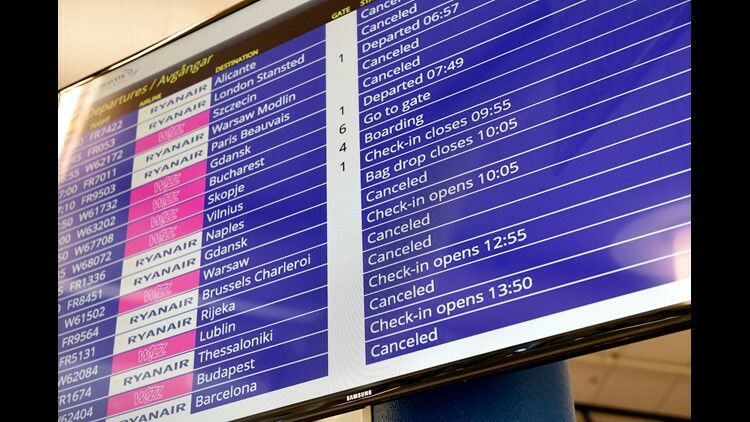 A flight information board shows many canceled Ryanair flights at Skavsta Airport in Stockholm, Sweden, on Friday Aug. 10, 2018. Ryanair's pilots staged a 24-hour strike Friday. Walkouts called by German and Belgian unions accounted for many of the cancellations, with strikes also called in Sweden and Ireland. Two attendants of Europe's biggest low-cost airline Ryanair caress camel "Ernie" standing in front of a Ryanair plane on March 29, 2011 at the airport in Bremen, Germany. The Irish airline started flights from Bremen to the new destination Marrakech in Morocco. This file photo from May 25, 2004, shows an employee of the airport in Hahn. Germany, guiding a Ryanair plane. Passengers at Dublin Airport pass a row of Ryanair ads highlighting recent service improvements in this Sept. 21, 2014, photo. Passengers board a Ryanair flight at Dublin Airport on Sept. 18, 2014. This file photo from Jan. 19, 2014, shows a Ryanair plane flying in front of a rainbow over Rome. This file photo from Sept. 21, 2014 shows passengers as they exit a Ryanair flight at Dublin Airport. This file photo from May 24, 2011, shows fliers queuing at a Ryanair check-in desk at the Dublin airport in Ireland. This file photo from Dec. 1, 2008, shows a Ryanair jet takes off from Belfast City Airport. in Northern Ireland. Michael O'Leary, CEO of Ryanair (left) and Ray Conner, CEO of The Boeing Company, hold a press conference announcing the first sales of Boeing's new 737 Max 200 to Ryanair on Sept. 8, 2014 in New York. This file photo from Oct. 11, 2014, shows a Ryanair Boeing 737 taking off from the Lille-Lesquin airport in northern France. Ryanair planes seen at an airport in southern France on Sept. 28, 2010. This Oct. 17, 2010, aerial view shows Ryanair planes at the Marseille-Provence airport in Marignane, France. This file photo from Nov. 8, 2006, Ryanair Boeing 737s at the Marseille-Provence airport in Marignane, southern France. This file photo from Sept. 1, 2010 shows a Ryanair plane at the Barcelona airport. A Ryanair jet at the Charleroi Airport in Belgium on Sept. 19, 2017. In this file photo from Sept. 1, 2010, a Ryanair plane takes off from Barcelona's airport. 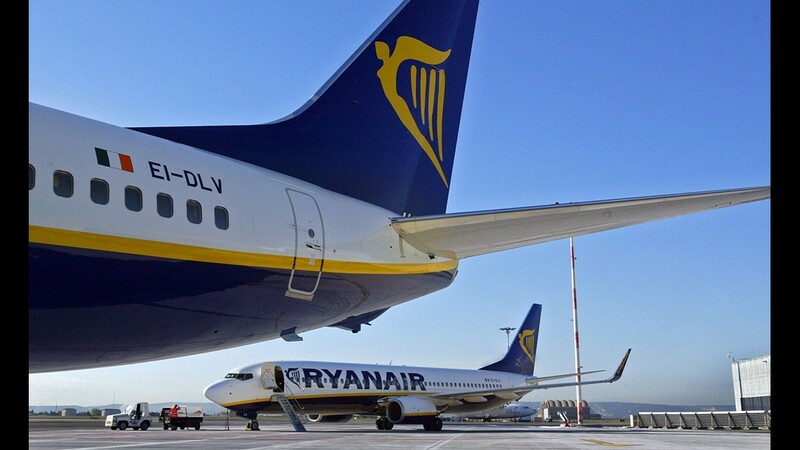 This file photo from Nov. 8, 2006, shows two Ryanair Boeing 737-800s at the Marseille-Provence airport in southern France. In this file photo from Aug. 2, 2017, shows Ryanair's outspoken CEO Michael O'Leary. This file photo from May 24, 2011, shows a check-in queue at the Ryanair desk in Dublin. Ryanair is known for its lack of frills and for-fee extras. Here is a "Ryanair specials" in-flight handout from 2006. A pilot waves as a Ryanair plane arrives at Schiphol Airport in Amsterdam on Oct. 27, 2015. In this file photo from Nov. 2, 2016, shows a Ryanair jet in from of one from German airline Lufthansa in Frankfurt. Ryanair airplanes stand at the Charleroi Airport in Belgium on Sept. 19, 2017. A Ryanair aircraft takes off from Lille Airport in France on Aug. 25, 2017. A Ryanair plane is parked at the Dublin Airport on Sept. 21, 2017. In this file photo from June 6, 2016, shows a Ryanair Boeing 737 preparing to land at Barcelona's airport. Staff leave Ryanair headquarters in Dublin on Sept. 21, 2017. A Ryanair plane is at the Dublin Airport on Sept. 21, 2017. This file photo from Jan. 19, 201, shows a Ryanair plane flying in front of a rainbow over Rome. In this file photo from May 25, 2004, shows an airport employee giving signs to Ryanair plane at Germany's Hahn ariport. Two attendants of Europe's biggest low-cost airline Ryanair pet a camel in front of a Ryanair plane on March 29, 2011, at the airport in Bremen, Germany. The airline started flights that day from Bremen to a new destination in Morocco. In this file photo from May 13, 2015, shows passengers disembarking a Ryanair plane at the Marseille-Provence airport, in France. In this file photo from Sept. 21, 2014, shows passengers as they exit a Ryanair flight at Dublin Airport. A Ryanair aircraft is painted in the Cable & Wireless logos in this photo from 2005. Ryanair jets at the Charleroi Airport in Belgium on Sept. 19, 2017. Fliers queue at a Ryanair customer service desk at Stanstead Airport near London on Sept. 19, 2017. A Ryanair plane passes a Lufthansa aircraft at the Frankfurt airport in Germany on March 28, 2017. Fliers disembark a Ryanair Boeing 737 at Frankfurt on March 28, 2017. This photo from May 10, 2007, shows Ryanair planes at Dublin airport. Ryanair headquarters near the Dublin Airport as seen on Sept. 28, 2017. The Ryanair annual report is shown in this photo from Sept. 21, 2017. A Ryanair Boeing 737 at Dublin Airport on Sept. 28, 2017. Ryanair Boeing 737s at Dublin Airport on Sept. 28, 2017. Ryanair's outspokean CEO, Michael O'Leary, addresses a press conference in Madrid on Aug. 24, 2017. Michael O'Leary, CEO of Ryanair (left) and Ray Conner, CEO at Boeing Commercial Airplanes, hold a press conference announcing the first sales of Boeing's new 737 Max 200 on Sept. 8, 2014 in New York. A Ryanair Boeing 737 lands at the Luton airport near London on Sept. 19, 2017. This file photo from Oct. 11, 2014, shows a Ryanair Boeing 737 taking off from France's Lille-Lesquin airport.